Blue Sensation is a soft blue metallic that dries with a satin finish. ONE COAT!! Spectacular! I have absolutely no clue why they put a "3D Glitter" sticker on the cap, but I'm so glad they did. It had me wondering if this was going to be something like China Glaze's Crinkled Chromes, and I bought it out of pure curiosity. So endlessly happy that I did! Blue Sensation will absolutely be in my 2015 favorites post at the end of the year. The color (not as blue in person), finish, application, all of it...terrific! As much as I adore the satiny finish, I had to see it glossed up too. 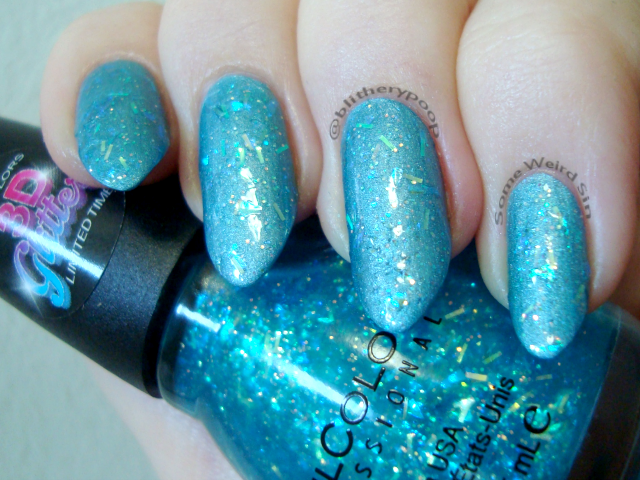 Late Night Haute has a mix of iridescent blue/green glitter, bars, and shards in a blue-tinted base. Hmm. So how's this 3D? Well...it tries pretty hard to poke out from under the topcoat. I guess that's what they meant. The chaotic confetti look could be fun for New Year's Eve or birthday manis. I can handle bar glitter or shards in moderation, but both in one? Hmm again. Daredevil's newest formula is bubblegum pink with delicate purpley shimmer. Yes, I swatched another pink. It happens. Much whining accompanies it. I sorta had to investigate this latest version of Daredevil, considering that the old version almost made me wish I liked pink. This isn't a return to the old version, but it's not as washed-out and sad as the one that's floated around for the last year or so. If the old one was a lighter, brighter cousin to Steel My Heart, the latest one is the same way for Fig. The formula is easy to apply, but a little sheer. This is three coats. Fig is magenta with fine shimmer. Bottom line: Blue Sensation is a must-have for Sinful Colors fans and anyone else who likes satins and/or soft blues. The newest formula of Daredevil lacks the hotness of the old one, but is a drastic improvement over the in-between version. Late Night Haute is...lumpy. There, I said it. 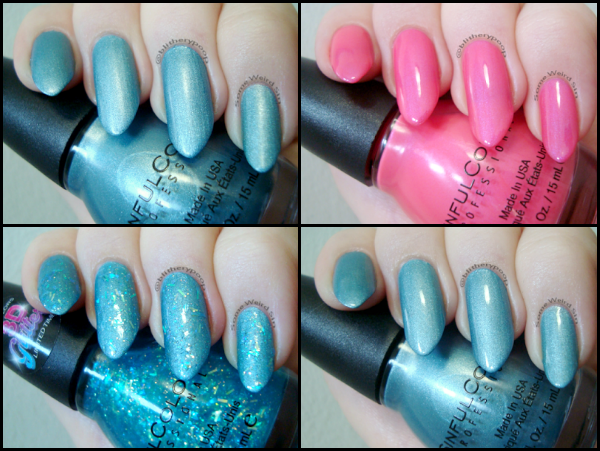 I'll probably be skipping the other two "3D Glitters". How weird is it that Blue Sensation has a sticker that calls it glitter (when it completely lacks any) and no mention anywhere of its satiny goodness? At least it didn't turn out like the Crinkled Chromes. Those were something, weren't they?